In case you don’t know yet: PUBG is short for Playerunknown’s Battleground, the most popular game on steam, with 2.5 times more concurrent player than Dota2. 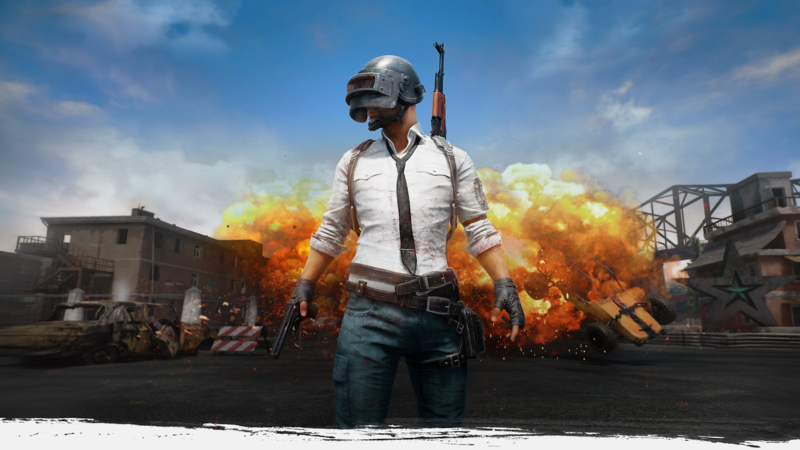 Let’s start with a little appetizer: the birth and growth of PUBG is an excellent example of how a designer grows and how iterative process can help shape a game to its best form. Brendan (our dear playerunknown) started by making the mod “DayZ: Battle Royale” for ARMA 2, then contracted with Sony to be the design consultant for H1Z1, and then hired by Bluehole Studio as the Creative Director for PUBG. It’s interesting to see an “unknown” designer grow by piloting and deep diving into a single genre - also making the growth of this genre a meta-iterative process. PUBG sets an example for how to use the Steam Early Access the right way: put the game on the store as early as possible (PUBG was developed for 1 year before the EA), let players play it, get tons of negative reviews, iterate on the design, update the game, and complete the circle. PUBG embraced the paradigm and the speed at which it rolls out new updates is fascinating - almost one every week. The control is weird! Camera rotation, character movement, driving, shooting, and fighting all felt dry and unpolished. Collecting items for 20 minutes and get headshot in 1 second is purely frustrating. I was a famous super bad FPS player. I hoped to win through strategic thinking and planning in this genre, but shooting skill is still emphasized here. Motion sickness. I’m not usually prone to motion sickness, but PUBG managed to make me motion sick within two matches. The reason could be dropped frame rate and camera movement. I feel pure hatred in every game. Maybe this is just not the right genre for me, cause I would prefer making friends than brutally killing people. I came up with the theory of Mediated Reality to interpret PUBG’s success: how Brendan managed to distill the best part of battle royale in real world, design mechanics around it, and present it to the player with a little more spice. I’ll elaborate on two main perspectives: distilled real world as design elements, and additional designs added as spice. Many effective elements in the game are drawn from real world. First, characters are designed in the way that players can relate to, and their roles change dynamically in the game. They are not soldiers, mercenaries, Mafia or anything alike. They are students, workers, fathers, etc - they are normal people, just like us. The familiarity of these characters makes it convenient for players to put in the shoes of their avatar and create the illusion that “I am what I’m controlling”. This also creates another interesting in-game dynamics: players’ role in the squad is dynamic. Unlike TF2 or overwatch where they can select their roles before entering the game, they get their role by collecting items. Sometimes the world-class sniper on the team just cannot get the Kar98k; sometimes the best close range fighter somehow collects 30 bandages and 6 first-aid kits. These elements make every new match a completely new, exciting, and rewarding adventure! Second, the map design is incredibly delicate and feels real. The “feel of realness” immediately comes to the player when they jump out of the plane, and I would credit that with the map design (or, level design). The town centers are reasonably far from each other, surrounded by smaller satellite towns, with smaller buildings scattering around them. But wait, real urban-planning doesn’t work that way: houses don’t just sit on the middle of a steep hill with no roads connecting to them; no houses should be built on the protruding side of the river; and surely, people don’t build storage cabins in the middle of nowhere. But all of the designs in the game world works well: steep hills provide space for strategic battle planning, storage cabins give the player a chance to get items without taking a big risk, etc. This also resonates with Valve’s theory on “experiential density”. PUBG did a good job with controlling experiential density with map design. And the map design facilitates the feel of hunting - collecting weapons and ammo is a good analogy of hunting in ancient time. Third, the game doesn’t help player process the information - they need to interpret battleground info by themselves. When you see a car, you need to think about it: is it there from the beginning; is someone in there; did someone abandon it; is someone guarding it; and most importantly, is someone looking at me while I’m contemplating about the car? And when you see a house an open door, you need to think: is someone in there; is someone guarding the house; do I still want to explore the house? All these raw information forces the player to focus on the game and always keep player’s brain running. And this is fair: when a player is baited by a loot box, he is the only one to be blamed, because he is the one who failed to anticipate this scenario and made the dumb greedy choice. Finally, you have only one life. This lies at the core of this game. The only life makes the game feel more “battle royale-ish”: everything you collect in one match won’t stay with you in the next match; no one can resurrect you when you make silly mistakes and die; if you take damage and have no medicine, you’ll stay damaged. All of this elements make the game more exciting and engaging. Besides those real-world elements that are distilled and used in the game, there are more common elements that are abandoned in PUBG. There is no hunger, no fatigue, no need for sheltering and warmth. All of them are deliberately kept out of the game so that player can focus on the one thing: “fight until you are the last man standing”. Removing stuff is actually harder than adding more, and I can see how Brendan decided to do so after making DayZ and H1Z1: in those games, sometimes players focus so much on themselves and allies so the spirit of battle royale is strongly hurt. I found PUBG’s design on the following aspects are fascinating: play area restriction, sound, and win condition. As PUBG is such a huge game, I will focus on these three. Play area restriction is a key element in PUBG, it controls the pace, facilitates encounters, and encourages strategic planning. Two restrictions are used: “the white circle” and the bombing area. White circles are shown before the blue circle starts shrinking, giving the player some time to breathe and think about what to do next. And the interval between showing white circle and shrinking blue circle get smaller over time, making the late game even more exciting and encourage the secretion of epinephrine. Although the position and scale of white circles are random, it’s made clear to the player that the white circle will shrink and it will be random. Players need to plan ahead to find the sweetest spot. And the task of finding that spot is made harder by unpredictable conditions, such as guarded houses and ambushes. But in this way, players are still responsible for failing to get inside the white circle. But I’m not fully convinced by the design of bombing area. I can see why it’s in the game: it encourages players to move rather than stay at the same place for a long time. But it’s still purely random. Getting defeated by a random element in such environment is frustrating. But I can’t deny that it simulates the real-world condition very well. Sound contributes so much to the intense atmosphere of PUBG. If you have played PUBG, do you remember that time when you get in a house and hear footsteps from the second floor; that time when you are running on the field and hear bullets fly at your ear; that time when you are driving and hear bullets hitting your plate armor; that time when you hide in a house and hear the roaring of car engine? All of this sound design works so well in the game and make the player feel so real! By the way, it also adds to the “raw information” as mentioned before. A simple example, when you hear a gunshot, you need to think: are they targeting me or someone else? The win condition is so simple, but there are so many ways to achieve it, and all are encouraged. Although collecting stuff and fighting is the most prominent play style, players can also play in their own way and still win. Some players are just not good at shooting and they would rather run and hide throughout the game. Some, like myself, may enjoy driving, and can use driving as the way of hiding and fighting. For example, there was one match when I got a Uzi and a Jeep from the beginning, and I drive everywhere to find people. When I find people, I crash into them, kill them, and drive away to find my next victim. That match I killed 6 players in this way. And then I found a shadow under a tree. I just sit there, 2 players passed without noticing me. However, I got headshot in the end:) This is just an example of how this game allows different play styles and how can a player use more than one playstyle in one match. Know what’s the best part of your game, keep distilling (i.e. deleting) until only the best part is left. If you want the player feel challenged and responsible for their behaviors, don’t help them too much. Be fair with them. If you are going to introduce randomness, inform the players of the randomness beforehand, so they can plan accordingly. Sound is extremely important in immersive experiences. I came up with these ideas after writing this artcile. Adding them may break the structure, nevertheless I'm patching them here.